Destination : Prague, Czech Republic. Prague was the last destination in our travels before moving to Canada. 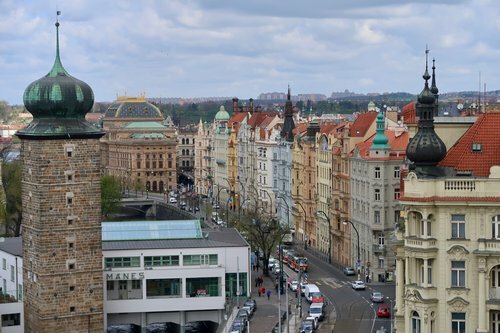 After spending most of our time in Europe around the Mediterranean, it was great to mix things up with a historical and quintessentially European city like Prague. The buildings were opulent, the Prague Castle was like peering into a fairy tale and the array of areas around the city made for a fun 4 days of exploring. Eager to see as much of the city was we could by walking, we focused our time on Prague Old Town, Josefov (the Jewish Quarter) and the Lesser Town. When we return to Prague, we’re keen to explore areas further out of the city centre. We stayed at the Clarion Hotel Prague City. The rooms were a decent size and a relaxing place to return to each night. Located a 10-minute walk from Wenceslas Square, the accommodation was central, however, not right in the centre of things. I’d stay here again, however, I would also investigate options right in the centre of Old Town Prague for a more conveniently located option. Over two long days in Prague we explored all the sights around the city by taking a long walk through the city and stopping at each place we wanted to see along the way. Here’s one way to approach a walk around Prague to see all the sites around the city. · Start at Wenceslas Square for a quick look around. · Walk down to the riverfront where the Dancing House is located. · Enjoy a drink at Glass Bar located on the rooftop of the Dancing House building. · Walk across the Jiráskův Bridge and continue along the river and make your way up the hill to Petrin Tower. · If you’re okay with heights and lots of stairs, walk up Petrin Tower and soak in the views. · Continue walking along the signed path to Prague Castle. 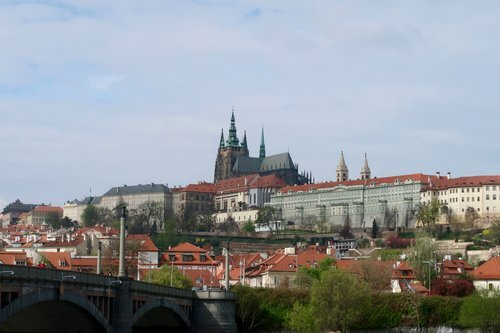 · After exploring Prague Castle, venture back down the hill to explore the Lesser Town. · Make your way to the Charles Bridge from the Lesser Town and cross back the Old Town. · Finish your adventure with a viewing of the Astronomical Clock. We were in Prague just before Easter so there were Easter markets in Wenceslas Square and throughout the Old Town. I know these markets can be touristy but it was still fun to walk through and look at the different stalls. 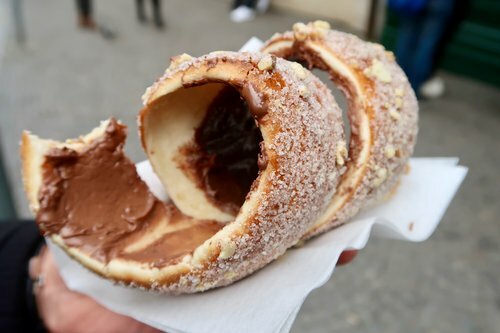 If you’re looking for a sweet treat at the markets, try at trdelnik. This traditional pasty is cooked on rotating rods over hot coals. Apart from smelling delicious, the sugar-coated pastry and option of adding Nutella to the inside makes this a treat that’s hard to try just once. Get lost in the historical streets of Josefov, the Old Town and the Lesser Town. Each area has it's own distinct feel and look. Fresh Nook is a great place to grab a quick breakfast, salad or snack. If you’re looking for fresh juices, a fresh sandwich, muffin or salad then this place is for you! We liked stopping by for a quick breakfast each morning before we walked around the city. Yes, it’s a franchise and no, it’s not Michelin star dining but Paul had a wonderful selection of fresh savoury and sweet pastries. With several locations around Prague, if you’re feeling like a hangry meltdown is surfacing, Paul is a reliable spot to grab a quick snack before you continue exploring. The sour cherry tart and goats cheese, cranberry and rocket croissant were delicious. One of the oldest pubs in Prague, U Pinkasu is a cosy spot where plenty of locals enjoy their beer. Settle in at one of the tables for a comfy few hours of drinks, animated conversations and a traditional pub meal. On one particularly rainy day in Prague, we went to Aloha Lounge. It’s the perfect spot for a late-afternoon drink and some bar snacks. Walking downstairs to look at the bar/club area, it looks like this place knows how to provide a great atmosphere for people to enjoy into the early morning hours. Don’t be deterred by the name of this place. Kafka Snob Food had a relaxed vibe and it was a great spot to have a few drinks, people watch and see the rain pouring outside. There’s also a couple of lounges at the back if you don’t feel like sitting at a table. History, architecture, colour, quintessential Europe. We thoroughly enjoyed our time in Prague and can’t wait to return and explore some areas further out of the centre. Have you done trips like this before? Visited a city for a short time and already making plans to see more upon your return? If you’ve travelled outside the centre of Prague, what do you recommend seeing? I’d love to read your recommendations in the comments below.